Who hasn't needed a paint spill cleanup? So many of us are Do-It-Yourselfers, especially when it comes to painting projects. We bring home our favorite paint chips and maybe even small jars of paint in order to choose the perfect colors. We raid the paint section of our local hardware or big box store for just the right types of paint brushes and buckets. We don clothes we don't care about, move as much as we can out of the way, and cover everything else with tarps before we begin our work. Most interior paints are water-based. This is an easy type of paint spill cleanup. Follow the instructions for cleanup on the paint can, if available. Always try the cleanup on an inconspicuous area first. A basic solution to help with the water-based paint spill cleanup is a solution of 1 part dish washing liquid to 1 part warm water. Gently sponge the spill with this solution and wipe gently with a cloth until most of the paint is removed. Then dilute any remaining spill with water and soak up the residue with clean cloths or paper towels. 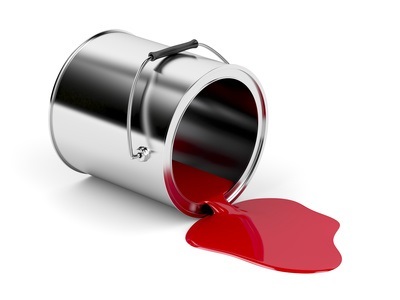 If the spill is already dry, try to soften it using a paint thinner recommended by the paint manufacturer. 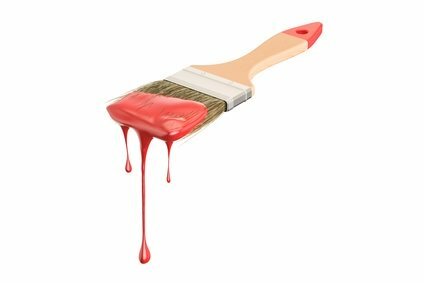 Turpentine is typically recommended for this type of paint spill cleanup along with as many absorbent cloths as possible. 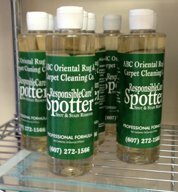 Dab the turpentine onto the cloths and then onto the spill, then rinse and repeat with clean cloths. Again, work towards the center of the spill so as not to spread it further. Just an important reminder: Cleaning with turpentine requires plenty of ventilation and all cloths are must be allowed to dry out completely before disposing of them to avoid spontaneous combustion. This is the easiest type of paint to remove. Wet the stain with warm water and then sponge it with a solution of 1 part dish washing liquid and 1 part warm water. After the spill is lifted, rinse. If the paint is on a type of textile that can be put in a washing machine, you can use that method. 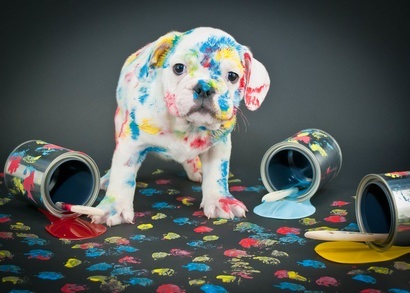 Please call our office with any emergency such as a paint spill on upholstery, carpeting or rugs. Time is of the essence so the paint does not dry and become permanent. 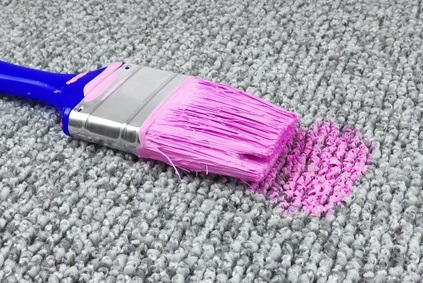 We will use whatever method is appropriate for the type of paint spill and the type of carpet, rug or upholstery fabric. We are here from 8 to 5 Monday through Thursday and 8 to 4:30 on Fridays. We are also open every Saturday from 10 to 1. Our phone number is 607-272-1566. You do not need an appointment to bring items to our plant. We also provide a pickup and delivery service. 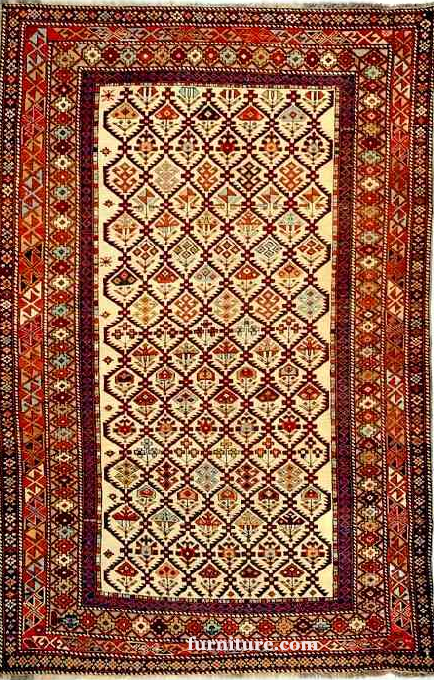 ABC Oriental Rug is on Facebook! 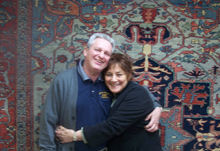 We regularly post tips and information about your carpet, rugs, upholstery, and tile and grout so please visit us often. We update our Facebook page with our latest discounts and we are also offering exclusive promotions to our Facebook fans. These are limited and short notice promotions. Give the Gift of ABC CLEAN!